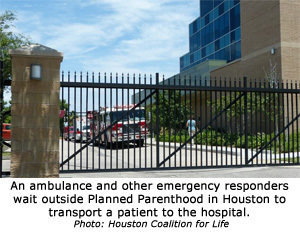 Houston, TX – For the second time in less than a year, the Planned Parenthood abortion clinic in Houston, Texas, has called an ambulance to transport a patient to a local hospital. The Houston Coalition for Life posted two photos on its Facebook page showing an ambulance, fire truck, and a third emergency vehicle outside the large multi-story Planned Parenthood clinic on August 14, 2013, at approximately 1:00 p.m. A woman suffering an unknown condition was transported to a local hospital emergency room. Last August, 911 records showed that another Planned Parenthood patient who was hemorrhaging was also sent to the hospital via ambulance. Yesterday’s incident is the eighth known medical emergency requiring ambulance transport since the 78,000 sq. ft. abortion facility opened in May, 2010. Planned Parenthood’s web site indicates that it supplies abortions up to 20 weeks gestation. According to Planned Parenthood’s public tax records, the abortionist of record is Martin Fine. View the Houston Planned Parenthood’s profile page at AbortionDocs.org.